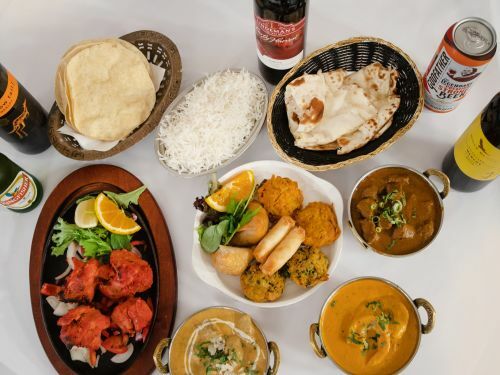 Indian Mahal - Dromana uses their own specialised couriers to deliver their food. Juicy lamb cutlets marinated in spices cooked in tandoori oven. Butter fried pieces cooked with diced capsicum & onion, chilli sauce. tomato sauce with capsicum & onion. Boneless pieces cooked with almond, cashew nuts & creamy sauce. Boneless pieces cooked with spinach, herbs and mild sauce. Boneless meat cooked with tomato, coconut, and special spices. Goan dish cooked with herbs and spices for the hot taste. Cooked with tomato, coconut, mustard seeds and traditional spices. Cooked and tossed with fresh vegetables & traditional spices. Tender meat cooked with spices, yoghurt, ginger, garlic, onion and tomato. Tender meat minced & cooked with green peas. Tender pieces cooked with fresh mushrooms and tomatoes. Cooked in onion gravy and fresh pumpkin. lemon juice and homemade spices. Medium pieces marinated in yoghurt cooked in tandoor then tossed in tomato sauce with capsicum & onion. Fish cooked with tomato, mustard seeds, and traditional spices. Goan dish cooked with spices and herbs for the hot taste. Cooked and tossed with fresh vegetables and traditional spices. Kerala fish curry cooked with coconut, mustard seeds and curry leaves kerala style. Boneless meat cooked in tomato, coconut and special spices. A delicious goan specialty seasoned with spices and vinegar and cooked with touch of goan vindaloo sauce. Medium pieces marinated in yoghurt cooked in tandoor then tossed in tomato sauce with capsicum and onion. Prawn curry cooked with coconut, mustard seeds and curry leaves kerala style. Yellow lentils cooked with tomatoes. Potatoes and cauliflower stir-fried with spices and tomatoes. Spinach cooked with yellow lentils. Spinach cooked with potatoes and traditional spices. Eggplant, green peas and fresh tomato in ginger garlic sauce garnished with coriander. Chickpea cooked with onion, tomatoes & vegetable gravy. Fresh seasonal vegetables cooked in light cashew nut sauce. Seasonal vegetables cooked with vindaloo sauce. Homemade cheese, potato dumpling mixed with garlic and nuts simmered in light almond sauce. Golden fried homemade cottage cheese cooked with spinach finished with green herbs. Basmati rice mixed with fruits and nuts. Basmati rice with coconut, mustard seed & curry leaves. Plain bread from tandoor, the perfect accompaniment to any curry. Wholemeal bread baked with garlic. Naan bread filled with cheese. Plain bread grilled with spices, dry fruits and nuts. Indian salad with chopped cucumber, onions and tomatoes with Indian spices. Full cream milk dumplings lightly fried and soaked in sugar syrup. Pistachio flavoured Indian ice creams.